"This recipe is from Linda Shapiro. 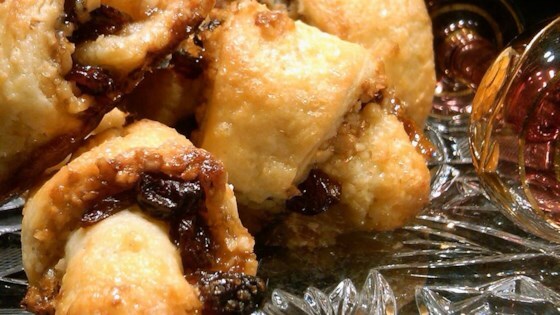 I have many rugelach recipes, but this is truly the best I have ever made." Shape crumbly mixture into four equal disks. Wrap each disk and chill 2 hours or up to 2 days. After rugelach are chilled, bake them in the center rack of your oven 22 minutes until lightly golden. Cool on wire racks. Store in airtight containers...they freeze very well. Substitute mini chocolate chips for the raisins, or use both...knock yourself out! My dough came out sticky not crumbly in the food processor. Double checked-ingredients correct. I want to make a few more batches. What did I do incorrectly?